The dominant anticyclone still sat over the UK bringing a fantastic clear dry day on Tuesday 11th April. The Race Officer Bob Chapple went out to the area near Waterloo Buoy With Jack Penty on the Committee boat and set the start line for the North West wind, which was a nice 7 to 10 kts. Fifteen boats (out of the 20 or so who have completed their race entry forms) came to the start area, 8 Q class, 6 U class and the ubiquitous Sweet Friday in W class. The Q class went off in an orderly fashion and spread left and right of the course indicating a perfect upwind leg to the Vilt buoy. It is great to see Jackdaw back in the fleet! (I wonder where Linda & Tony are?*). U class manoeuvred for their start and Aurora made a successful pre start luff on Trifle and Kaimana. Kiamana had to tack around before the committee boat. Trifle luffed then dipped and got to leeward of Aurora and tried unsuccessfully to luff her over the line. The Go Pro footage shows some interesting sailing! 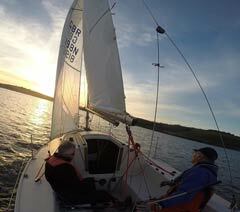 Ron Jones in Deep purple went off like a rocket, with his shiny new mainsail, reflected in the sun. He was first around the Vilt closely followed by Aurora. 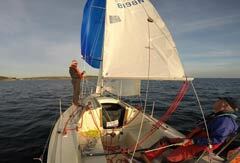 They both set starboard pole kites and set course for Carricknath buoy. On Trifle we set a port pole kite and went over to the Roseland shore where there was a stronger convergent breeze. Q class were headed for the same mark and set a colourful sight with their spinnakers. Trifle overhauled Aurora before the mark and set off on a starboard tack to try and catch Deep Purple as we beat towards Governor buoy. Q class were further up wind as they beat toward Trefusis. Deep Purple made an early tack in the middle of the Roads as there was a 10 degree wind shift. On Trifle we held on to this header for a minute or so and came back into a big lift. Aurora and Kiamana went into the western shore as Trifle short tacked for the buoy. They both lost a lot of ground. A windward kite takedown earlier enabled Trifle to set a port pole kite to Castle Buoy and were a long way down track before Aurora rounded Governor. Finally we rounded the mark and set off for the long beat back to the finish. We crossed tracks of Q fleet who were on a spinnaker run from Trefusis to Pendennis mark before their final beat to the finish. As we approached the Harbour entrance the Race officer announced a shortened course with the finish off the eastern arm of the docks due to an imminent shipping movement. Excelle, John Fox won the Q class IRC handicap beating Temaraire, Martin Eddy by 49 seconds corrected time. Trifle won the U class IRC handicap beating Aurora by just under 3 minutes corrected time. Sweet Friday had a sail over. We went back to the clubhouse and had good food and beer while watching a glorious sunset over the Penryn river. Thanks to the ops room staff, Race committee, bar and catering as well as Giles the boatman. Chris clearly favours IRC over Byron. If the Byron handicap results are preferred, Ian Jakeways General Khaos wins Q class, followed by Scorpion. In U class, Ron Jones' Deep Purple comes first. If only Ron had an IRC certificate, he might well have won in IRC too. All photos from Chris Jelliss' Go Pro. We would always be pleased for any extra pictures. There was a photographer buzzing round Aurora, and the mighty Hawk has photos on their Facebook page, but finishing at the docks meant no photos from the Ops Room. *Portugal according to Linda's Facebook post.